To Serge Or Not To Serge? That is the question. Yesterday was meeting day. I attended a very nice business luncheon and met lots of other people in small local businesses. I even finished the bookkeeping. It was a very productive day. Today I need to continue stocking up the Etsy store. I've been thinking lately about the things you can do with one square of fabric. If you make the square 10" to 12" and hem around it, you have a handkerchief or cocktail napkin; 20" square is a dinner napkin; 36" square is a bandana; and much larger and you have a tablecloth or blanket. I've also noticed lately that merrowed edges are becoming more popular than hemmed edges. A nice hem seems so attractive to me but they take time to do. Merrowed/serged edges do appear neat but not as neat as the hemmed edges. They are fast if done with a serger. As Mama used to say "zip, zip, zip, zip and you're done." I've been doing my handkerchiefs with rolled hems but have noticed that many of the store bought handkerchiefs have serged hems or if they have lace, the fabric is just folded under once with the lace on top. Although I'm sure this is secure, I don't like the idea of possible frayed fabric showing on the underside. Anyway, I'm thinking about doing some serged edges. Besides, I haven't used my serger in awhile and it needs to work, too. We have a customer who wants some kitchen towels to give as a gift. The recipient of the kitchen towels are a couple. 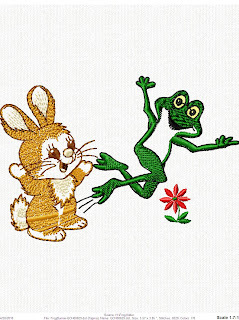 The man likes cute bunnies and the lady likes frogs. 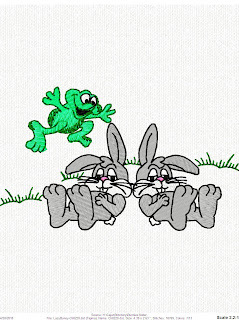 Our assignment is to come up with some cutesy design, in earthtones, incorporating a bunny and frog. The first one is super cute but makes me think of babies. The second one has more attitude but could probably use even more attitude. Although this second one does put a smile on my face. We did some more handkerchief monogramming on the pretty store bought hankies and one of the black polka dot, handmade hankies. The red pursed lip design is adorable but I was concerned that it would be too dense for such a light piece of fabric. I certainly wouldn't want that design any denser but it did stitch out. Goodness, gracious. I was trying to upload the photos for this post and the "insert image" function has been changed a bit. Now I have to figure out how to get this done. The pictures are on here but it was like pulling teeth. It's Monday morning and I'm looking forward to an exciting week. One of our neighbors' birthday is coming up this Thursday and as of Saturday, we had not finalized any plans for a party or get together. Saturday was a very rainy day but Sunday was forecast as clear skies and a high of 81 degrees. We decided to have the birthday party at Johnson's Beach on Sunday afternoon around 4:00. I begged to bring salad because we have so much lettuce in the garden that I cannot use it fast enough. Sunday morning George ran to the store and picked up some nice, white kitchen towels. 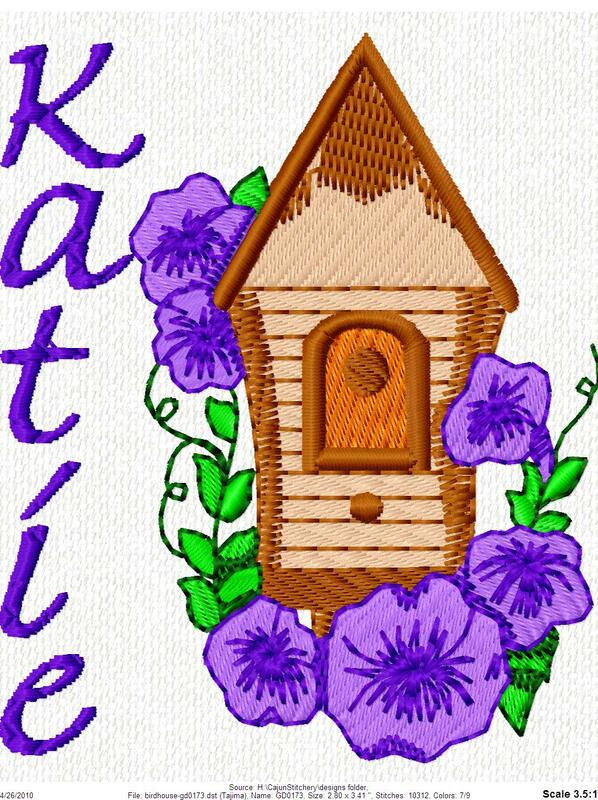 I know the birthday girl has birdhouses and a pond in her yard that she enjoys, so we designed a motif with her name "Katie" and a birdhouse. It really turned out lovely. Guess who forgot to take a picture of the towels? Me! At least I do have the capabilities of turning the design into a jpg so you can see. Between the salad and the towels I worked until the moment we left for the beach. It really was a beautiful day. The beach was windy and the water was cold but the skies were blue and the temperature felt warm in the sun. We drank wine, ate a fabulous dinner, watched presents being opened and played on the beach. I rolled my blue jeans up to my knees and was wading with the others in the surf. One wave snuck up on me and my pants got wet anyway. We finalized the day with birthday cake that another neighbor made and singing Happy Birthday. All in all, I guess we were at the beach for a couple of hours. Katie loved her towels and said they are so pretty she wants to frame then and not use them. Gosh! George and I hadn't been to Johnson's Beach since the early 1990's. There are more condos out there now. In the park area they have a lifeguard stand, restrooms, paved parking lot, outdoor showers for rinsing off the sand, and covered gazebos with picnic tables. They also have concrete grills. There are nature trails and a boat launch, as well. Quite a change from years ago when it was just park on the side of the road and walk across the sand to the beach. All of that work and sun made us tired. Once we returned home, George and I relaxed in the living room to watch a movie. I snoozed on and off throughout the movie; George fell fast asleep and missed the entire movie. When the movie was over I thought I'd check my emails and do a general computer clean up before going to bed. Well, I am glad I did that! I opened up the Cajun Stitchery email and to my pleasant surprise a customer had purchased 2 handkerchiefs from our Etsy store. She purchased the "Funky Hanky" and the "Lace Handkerchief". I almost started crying for joy. Wow! Someone, all the way in Michigan, that I do not know, saw the items in our Etsy Shop and thought, not one, but two were worth spending their hard earned money to purchase. Suffice it to say that I just stared for a long time at that email, trying to take it all in. The next email was from PayPal acknowledging receipt of payment for the purchases. By this time, George was awake and came downstairs to see the wonderful emails. Of course, I shot out an email to our new customer thanking her for the purchase and assuring her that the handkerchiefs would be placed in the mail on Monday. As of this writing, the purchases have already been mailed and the customer notified. It's a good thing that I had taken the time last week to watch several of the Etsy videos because one was specifically talking about how to wrap an item that's been purchased. Those Etsy people are so creative. They suggested taking a little bit of this and that around the house and voila beautiful packaging. I don't rate with those creative minds but it did give me ideas. I wrapped the hankies in some pretty glittered pink (repurposed) tissue paper, made a tiny bow from fabric (same fabric as the hankies) scraps and attached (with double sided tape) a little Christmas ornament made on the embroidery machine (lagniappe). I filled the package with rosemary leaves for a pretty scent and left it overnight. This morning I took the rosemary out of the packaging and put it in a mailing package. Gee, I sure hope she likes it. Now I need to get busy and put more stuff in the Etsy Store; at least enough to replace the items purchased. Today I expect my friend, Lois, to visit. Lois called yesterday and wants to take some of our spices and lettuce from the garden. She is certainly welcome to it. Even the huge salad that I made yesterday hardly put a dent in the lettuce crop. Speaking of the garden, we noticed some tiny tomatoes on the Better Boy plants. We will be harvesting tomatoes soon. Sassy Satsuma was covered in flowers which have now dropped off. She is now covered in tiny round green fruit which I believe will turn into lucious satsumas in the near future. And the new blueberry plants have many tiny blueberries forming. We need a lot more of those blueberry bushes. All in all the garden is producing and looking beautiful. Tomorrow is going to be a busy day because I plan on attending a BNI meeting to see what it's like. Afterwards, I am having coffee with a friend downtown. Someplace in there I need to drop off some totes that I embroidered for another customer. We embroidered this Kayak Survival Kit for a friend to give to her friend. We have kitchen towels, handkerchiefs and pillowcases to embroider this week, as well. So, it looks like it's going to be a busy week and that is a good thing. Don’t forget to visit http://www.cajunstitchery.etsy.com/ often. Yesterday was Earth Day. What did you do for Earth Day? At Cajun Stitchery, we spent time learning to fuse plastic bags from an Etsy video on the internet. If all works well, you will see some of our designs using fused plastic bags in the near future. We began trying to put the cap sash on Boudreaux yesterday. It appears that we were missing a few screws – for installation of the sash, that is. We have had Boudreaux for one year and we know he is capable of embroidery on ball caps. The information that we have read and heard about the cap attachment left us afraid to even try it. Several people have requested them but we have always put them off because the attachment is so ominous. We decided to bite the bullet and overcome our fear and put the thing together. We had manuals out and watched videos and when all was said and done, we were missing 2 screws. We have ordered the screws and they should be here next week, when we will try again. This week has been full of Etsy. I’m trying to get that store up and running. We had one sale and finally got to see PayPal work from a seller’s point of view. It is a piece of cake. All of that fretfulness was for nothing. As you know, all of our handmade items are sold on Etsy. Our one Etsy sale was a friend who purchased 2 handkerchiefs off of Etsy and then hired us to embroider the handkerchiefs. That is the way it is supposed to work. Additionally, this week we’ve worked on several designs, just because. There are so many beautiful stock designs that I would love to stitch out. There are also series of designs. For instance, this week we stitched out the cutest little frog. That design was one of a series. I learned a new term this week. Kitsch, defined as “over the top.” I was working on a few items for Etsy trying to be real creative and kitsch and embroidered some lips. The lips are another instance of a series of designs. They are so kitsch and cute. Simply lips showing many different expressions. The garden is beautiful this time of year. We eat fresh salads almost every evening. The romaine lettuce is abundant – sure wish someone would take some of this romaine lettuce off of our hands before it goes to seed. There isn’t a lot you can do with lettuce other than eat it fresh. You cannot can or freeze it. I’ve heard some people cook it but I’m not one of those people. If it’s not used, it just goes to waste. At least over here it’s not completely wasted since we will recycle it in our compost. The asparagus is being harvested every day. The broccoli is holding its own. The garlic and onions are almost ready to bloom. Our one horseradish is now two. I am anxious for our big tomatoes and bell peppers to start producing. There are flowers on all of those plants. The idea of leaving one area of the yard for the blackberries may have been a good idea because that area is covered in berries but are not ripe enough to pick yet. And Sassy Satsuma and the blueberry plants are starting to drop flowers and turn into fruit. We thought we lost the banana trees but they seem to be coming back, albeit slow. The little fuzzies from the oak trees are just about finished falling. They left behind a beautiful layer of mulch on all of the gardens. Of course, George will probably have to get back on the roofs and get the remaining fuzzies off. I’m just glad the dogs are not dragging so much of it into the house. My next door neighbor is moving back up north. Last night she and I got together for a glass of wine and a game of Scrabble. She was here when Mama was here. She held me the night Mama was dying. I’m certainly going to miss her. We have so much fun together. Her new job is just one of those opportunities in life that you have to take. We are planning a going away party on May 7th. I’m boiling shrimp and others are bringing desserts and appetizers. It should be a good time for all. Last night we laughed at how Mama would cheat at Scrabble. Now I’m sure my mother would take offense at me saying that she cheated, but she did. If she got a Scrabble tile that she didn’t want, she would silently drop it on the carpet beneath her and say, “Oh, I don’t have enough tiles, let me get another.” Mama was impish like that. Become a “friend” on the blog and never miss a post. right away. She said, "But we don't know anything about each other." Boudreaux said, "Dat's all right, we'll learn about each odder, as we go along." She said," That was incredible!" her towel, not even breathing hard. but I worked both sides of the bayou!" Cut the handles and the bottom off of plastic bags, leaving only a round piece of plastic, open at the top and bottom. Fold in half (making 4 layers), then fold in half again (making 8 layers). Place the folded plastic between 2 sheets of wax or parchment paper. Iron the paper (no steam) for 10-15 seconds. Do not rest the iron in any one place. Turn the sandwich over and iron the other side for 10-15 seconds. Pull back the paper and you are left with fused plastic that can be cut and sewn. If the fused plastic has any air bubbles, put it back in the paper sandwich and iron again in those areas. It will take some trial and error but this is very simple. If there is printing on the plastic, turn the bag inside out to avoid ironing on the ink. Once done the fused plastic can be used as fabric for all sorts of projects. The weather is warming and the beaches are filling. Get a tye dyed beach towel this year. We're still making hankies over here. Now we're trying to get funky, too. Oh sure, we did some real pretty, heirloom type handkerchiefs, like the beautiful ones in the photographs. Using the Etsy article mentioned in the last post, the designs hopefully are becoming more creative and "funky." Last night the hanky with the red lips on the black polka dot fabric was put on Etsy. Two friends have already commented on it and they love it. The lips really do look like lipstick, but it's embroidery. In fact, there is an entire group of lip designs. Every chance I get, I like to stitch out some design that I've never done before, like the laid back frog. People ask how long it takes to stitch these designs. Of course, it depends on the design and how many stitches there are, but usually it doesn't take too long. What takes time is the set up for the design. The design has to be located. Then we have to decide on the colors and assign the correct needles. We may have to resize the design or redigitize part of the design. That takes a considerable amount of time. Yes, sometimes hours. Then we put the design on a 3 1/2" floppy disk. Bet you thought those things were a thing of the past. Although modern embroidery machines are going toward flash drives, many of the older models, such as Boudreaux, still use the 3 1/2" floppy disk. Anyway, we put the design on the disk and take it to Boudreaux. We upload the design into Boudreaux and put the correct color thread in the correct needles. Since we have 12 needles, sometime this entails threading 12 times. George hates threading needles. We trace the design, which means that we put the hoop that we expect to use in the machine and tell the machine to trace. There are a couple of tracing options but we usually use the one that goes to the limits of the design to see if the hoop will fit that design. Once we have the proper hoop, the design uploaded, the correct color thread in the correct needle, then we hoop some scrap fabric of the type that we plan on putting our final design (knit or woven). We stitch out a sample to make sure everything is as it should be. We make any adjustments needed. Sometime this requires another sample stitch out. When the design finally stitches out the way we want, we hoop the item and do the final stitch out. For instance, The lip design had 4 colors originally. When it stitched out, I didn't like the look and had to take the design back to the computer and start again, until I liked the design. The lips took about 5 minutes to stitch out but the set up took probably an hour or two. I am still perplexed at the pricing thing for Etsy. When I sold the handkerchiefs on Etsy, I paid Etsy's fee and PayPal's incoming and outgoing fee. I didn't know how to get either to adjust for sales tax. The item was sold in Florida. Finally, I found how to do that on PayPal. Hope it works. Anyway, you can imagine that if I sell something for $5 and pay all of those fees, take the cost of making the item off, the profit is very meager. There comes a point where you have to stop and ask yourself if this price is worth the making the item. If not, the price either has to be adjusted up or you don't offer that product. That's why I like embroidery on ready made items. Once I take the cost of the item off the top, the design and embroidery work is a pleasure and we have fair, set prices for that. I just have to pull myself back and remember that the reason I'm on Etsy in the first place is my need to create. Another article that I recently read said that items that do not sell well on Etsy, usually sell very well at craft fairs and vice versa. I'm thinking about putting some of the items that did not sell at last year's craft fair on Etsy, just to see how it goes there. Well, I have to get back to Boudreaux. See ya next time. Happy Monday Morning to you! We've been busy at Cajun Stitchery this weekend. You can now purchase items from Cajun Stitchery with cash, check or PayPal. You can also purchase via email (cajunstitchery@yahoo.com), phone (850)261-2462, Etsy (http://www.cajunstitchery.etsy.com/), or Facebook (just message me, Peggy Henshall). Those little polka dot hankies have been a real winner. We received an order for 5 of them from one customer and 4 from another. Since these are handmade, they must be purchased through Etsy. Once I get the hang of Etsy, the prices will probably go higher. Turns out that when you purchase from Etsy, I pay Etsy's fee, PayPal's incomng fee, PayPal's outgoing fee, plus sales tax if you live in Florida. Of course, this is a business and those fees, although not much, must be offset in the price of the item. Plus there is the time involved in anything handmade. All of that adds to the price of a single 10" square piece of fabric. Wow! Am I learning a lot about business. There are so many designs that I would like to stitch out. I cannot help myself, I love to embroider and I love to watch that machine create artwork. This horse is a beautiful design. I had planned on putting it on a handkerchief but after stitching it out, realized that it is just too heavy and dense of a design to work on a hankie. This design would be lovely on a tote or even on a shirt. I enjoyed stitching out the flamingo in a beach chair. There is a whole series of these adorable flamingos. None were ever ordered, so I stitched it out on this towel as a donation to the Pensacola Beach Optimist Club's raffle. In a like manner, this cute fun in the sun hand towel was done as a door prize for the Gulf Breeze WBL meeting. Some time ago, George suggested that I do a design that says "Mais Oui, Cher" (pronounced: may we sha), meaning "yes, dear". He thought that since we are Cajun Stitchery, we should include some Cajun. I found the design of this tree which reminded me of the bayous in Louisiana. I like the design. I made one on a goldish colored hanky and put it on Etsy for sale. Another customer ordered a set of pillow cases this morning. We haven't done pillow cases in awhile and this is a pleasant expectation to get onto the pillow cases. Don't forget our pillow cases are $20 for a set of 2, plus the embroidery. Hotel quality pillowcases in white. I just love this little wine bottle apron and chef hat. They are selling for $10, plus embroidery. The embroidery would go on the apron. Notice the floral centerpiece on my table -- vegetables out of the garden. Another unique item that we purchased. This beautiful hanky his folded so that it slides inside the cardboard bodice on that tiny coat hanger. These are $10 each. When I purchased it, it was labeled as a wedding favor. I just thought it was cute. Have you noticed the shadow on the bottom of many of the photographs. I'm trying to figure out how to get rid of that shadow. I think maybe I'm standing in the wrong place to take the pictures. I'll have to work on this shadow thing. It's a good thing that I don't hold myself out as a photographer. Until next time, c'est toute mes amis. Hope everyone got their taxes done and filed. Take a deep breath and exhale. It’s over for another year. We had several visitors this week and you know we enjoy company. Evie and her neighbor dropped by to pick up Evie’s napkins with the frog motif. She wants a set of 12 napkins for the holidays (Thanksgiving, Christmas) but she and her husband cannot agree on the motif. She wants frogs and he wants something more traditional. I’m working on a few designs that I hope please both of them. The beautiful tablecloth and napkins with the poinsettia design were a big hit. Amy gave her gift to her aunt who was simply thrilled. Now they want five more matching napkins. Good going, Amy. We have what’s known as Florida snow. Those little fuzzy things that fall off the oak trees this time of year are everywhere. They stick to my long haired dog like velcro. Our house, inside and out, are covered in them. The nice thing is that it’s only a couple of weeks out of the year that we have to deal with this. George got on the roof next door with the leaf blower yesterday and that roof was covered in the little fuzzies about 3” deep. The good thing is that the fuzzies cover the garden and look like a really nice, neat mulch. As I look up into the oak trees, I still see more of these fuzzies that will fall but I think the bulk has fallen. I do have an announcement. I contacted the company selling the clamping system. This was a purchase in the making. However, it turned out that the system will not fit Boudreaux. The clamping company even contacted the SWF manufacturer (Boudreaux’s mama) and it just won’t fit. So, the decision was made for us. One of my friends in Central Florida who has her own embroidery company suggested that I make the mats myself and do the embroidery that way. It’s possible but as I’ve said so many times before, making things by hand takes a lot of time. We put the idea of the welcome mats aside and proceeded with the handkerchiefs. We had ordered the pretty little handkerchiefs and using the tracking feature for UPS found that they should be delivered last Monday. Monday morning the UPS tracking site said they were in Pensacola, loaded on a truck for delivery. No package. We waited all day and into the night and no delivery. Back at the tracking site revealed that UPS needed a better address. Now we’ve lived here for 18 years. UPS has delivered many things to our house. I called UPS Tuesday morning to help them find me and was told that they figured it out and the package would be delivered that day. Late afternoon came and we saw the UPS truck. We started out the door when the UPS truck passed us and parked at the house next door. Yep, it was a new driver. He wasn’t familiar with the area. We finally received our package and I hurried inside to open my little treasures. Go to the Cajun Stitchery page on Facebook. I took pictures of each style of handkerchief that we purchased. They are all so dainty and beautiful. Each is embellished in some way with lace. All are 100% cotton. We also purchased a few other things from this company. 100% cotton, waffle weave, white kitchen towels. Those are 21” x 28”. That’s a really nice size kitchen towel. I’ve already used 2 of them and may have to purchase more. I only bought 5 of them. We also purchased a really adorable wine bottle apron. It’s white, 100% cotton, plain to allow for embroidery, and comes with the cutest little chef’s hat to go on the cap of the wine bottle. Then, last but not least, we purchased what was labeled a favor for weddings. It’s the bodice of a wedding dress cut from cardboard. A lovely handkerchief is delicately folded into a sort of but not quite diamond shape, the point of which goes into the cardboard bodice and all hang from a tiny little coat hanger. Basically, you get a handkerchief folded in such a way that it looks like a miniature wedding dress on a coat hanger. It’s really cute. Cajun Stitchery is selling the handkerchiefs for $5.00, plus cost of embroidery. The kitchen towels, wine bottle apron with cap, and wedding dress handkerchief favor are all $10 each, plus cost of embroidery. I continued making the black polka dot on white fabric handkerchiefs with the intent of giving them to each of the ladies on Wednesday night. Each handkerchief had their first name initial embroidered in the Curlz font in black thread. They looked very nice. When I handed them out, everyone seemed to like them. A few of the black polka dot handkerchiefs are on Etsy for sale. I was getting tired of the black polka dots and went onto a goldish colored fabric that I have. In fact, I’m making handkerchiefs from this fabric now. They are only handmade and are not as beautiful and delicate as the hankies that I purchased. Well, apparently I was wrong. My dear friend in Alabama who had received the gift certificate wants the black polka dot handkerchief. I told her that the handkerchiefs were in and to please go to the Cajun Stitchery page on Facebook and let me know which style she wanted. She wants the black polka dot handkerchiefs. Yes, I am extremely flattered, but that wasn’t at all what I had intended. However, the customer is always right and by gosh if she wants black polka dots, she will get black polka dots. Once I run out of the black polka dot fabric, there is no more. I should have bought the whole bolt of fabric but who would have thought! This leads me to remember an article that I read this week. Etsy, and so many other sites, have some wonderful articles on how to sell on their site and marketing in general. The article that I’m referring to said that no matter how crazy it may seem, if you’ve wanted to try something special with your craft, or try a special craft, to do it and put it on Etsy for sale. Go out on a limb. The reasoning is that you never know if your item may become an internet sensation that everyone has to go see. Even if it doesn’t sell, you are bringing people to your site to see all of your items. There simply is no way of knowing what people will buy at any given time. The trick is to get them to see your wares. Since I do not have a store that you can walk into and browse, the internet is my store, either the dot com, the blog, Facebook, or Etsy. So, please visit my stores and let me know what you would like to see. What about the ambiance? Would you like a store with more warmth? With more variety? Just let me know. Since Cajun Stitchery does custom embroidery, it’s hard to put all of our wares on the internet because if you need a polo shirt, a hoodie, a tote, handkerchief, tablecloth, napkins, whatever, we can get it for you and put whatever embroidery you like on it. We purchase from wholesale companies all over the US. So, it is difficult to put everything on a shelf for you to see. Most of our wares haven’t even been created yet. What you can see are samplings of what we can do and get for you. There is so much to tell you and show you but this e-newsletter is getting rather long. Visit the various Cajun Stitchery websites and just look at all we are doing. Don’t forget Earth Day is this month. Be kind to your environment. Boudreaux and Thibodeaux had bought their own airline. On their first flight from Lafayette to Jamaica, they ran into motor trouble. Thibodeaux came on the speaker and said, "We are going to have to make an emergency crash landing. We are over the ocean so all of you that can swim please move to the left side of the plane, and all of you that can't swim, please move to the right side. As soon as the plane hits the water I want all of the people on the left to swim for shore. All of you on the right, well, Captain Boudreaux and I would like to thank you for flying Cajun Airlines. Old Jean Pocket Holders- Cut out the pockets from the seat of the jeans. Add magnets on the back and use to stash craft supplies, a notepad and pencil for shopping lists, business cards, coupons or other items on your magnet board or fridge. The handkerchiefs arrived last night. Finally. They were supposed to be here Monday but UPS said they couldn't find our house. All's well that ends well and they arrived. They are so pretty. Of course, while waiting on the handkerchiefs, I made a bunch of them by hand. I kind of like the little handmade ones. I added lace to the last one I made and I really like it. I guess I ought to start making some out of some other fabric than the polka dot fabric. Can you tell that I really like that polka dot fabric? I was browsing around on Etsy and other websites and noticed that this type of ladies handkerchiefs are given on special occasions with writing. For instance, a white hanky with a light gray church bell design and a wedding date. Also, a great idea is for Mother's Day, which is right around the corner. Don't limit yourself to ladies hankies, there are also men's handkerchiefs. Those men's handkerchiefs with their initials embroidered in tiny letters in a corner are very high class. Then there are the handkerchiefs that men wear in their coat pockets. If we could change from using paper tissue to cloth handkerchiefs; paper napkins to cloth napkins; paper towels to cloth hand towels, I wonder what kind of impact that would have on our eco-system? All I know is that it would be better for the environment. What other throw away paper products do we use? Real plates could always be substituted for paper plates. Of course, paper will disintegrate. The purpose for cutting down on the paper products is to save the rain forests. When my boys were young we did an experiment with dryer lint. You can take the dryer lint, we it and mash it into a sheet. Put the wet sheet inside a telephone book or something heavy and flat to let it dry. When it's dry, you have a sheet of paper. The term "rag content" when used to describe paper comes from the fact that a long time ago after your clothes were worn out, you used your clothes for rags. When the rags were worn out, you put your rags outside your door for the rag collector. The rag collector would take the worn rags and make paper from the fibers. Not unlike our experiment with the dryer lint. The rags were usually made from linen and made a good quality paper. So, today, the higher the rag content in your paper, the higher the quality of your paper. Makes me wonder why we have to cut down trees to make paper at all. The main problem is plastic. We need to get away from using so much plastic. What alternatives can you think of for plastic? We could make cloth baggies, but that's not as sanitary as plastic and really doesn't achieve the same outcome. Hmmm. I'd love to hear ideas for common sense type alternatives for your day-to-day plastic. One thing that comes to mind is plastic placemats and tablecloths. For goodness sake don't use plastic for placemats and tablecloths since you can get such lovely cloth placemats and tablecloths. We took some time to put the Cajun Stitchery logo on some of my shirts yesterday. Playing with colors is a favorite pasttime over here. Have I told you that we love to embroider at Cajun Stitchery? Yes, we do. I'm so excited. The shipment of dainty handkerchiefs is scheduled to arrive today. These handkerchiefs will be $5 each, plus whatever embroidery you want on them. This weekend has been filled with handmade handkerchiefs. I don't even know how many I've made this weekend. As you know the handmade items are for sale on our Etsy shop. So, please visit. I'm still making the little handkerchiefs and now I'm thinking about putting lace on the handmade ones. I think I have them on Etsy for $5 or $6 apiece with embroidery. Handmade items are slow and these take me about a hour or so to make. Those hand rolled hems can be time consuming. I really should up the price but I'll leave it for now. Let's see if anyone wants them. Besides I'm interested to find out how the PayPal thing works. Cajun Stitchery has PayPal and that's the only way you can purchase off of Etsy but it's never been used. I need to put more stuff in the Etsy shop. By the way, if you ever want to purchase anything from Cajun Stitchery, you can use PayPal to purchase. That's fine with me. This shop is custom. The way it works is that you email or call me and tell me what you want. I prefer email because I want to get everything precisely to your liking and I can review your emails to make sure I haven't forgotten anything. I work with the designs and email pictures back and forth to make sure you are happy with the direction we are going. When we get your order down pat, I send you a quote and you let me know to go forward or not. By that time, I certainly hope you want to go forward because I've spent a lot of time and effort on your project:>) Once you accept the quote, I complete the project and let you know when it's ready for pick up. And, I usually send you a picture of the completed project with the breakdown of the cost. You can pay me via PayPal at that time, or you can come over and pay via cash or check when you pick up the item. As you can see from the price list on the right hand side of this blog, for the larger orders we do require 1/2 payment up front before we go to the expense of purchasing items for you. Cajun Stitchery doesn't mind shipping projects at all. If you want to place an order with us, it really doesn't matter where you are located. It's the same process as above, with the exception that prior to receipt of your project you either use PayPal or mail us a check -- it is never wise to mail cash -- and we will ship your project to you. Of course, shipping charges will have to be included in the cost. If the project is shipped outside of Florida, there is no sales tax. If it is shipped inside the state of Florida the sales tax is 7.5%. We usually use the U.S. Postal Service and we don't mind insuring the shipment, upon request. Cajun Stitchery tries to make the business of purchasing items as simple as possible. In fact, I recently had a conversation with a friend about this exact subject. When I go shopping, I want to see a price and buy the item at that price. I don't want an extra fee here and there surprising me at check out. I feel the same way about Cajun Stitchery. Although there are always exceptions to the rule, I try to sell items for the cost of the item, the embroidery, and tax/shipping. Very simple. I've been told that I can make more money by pricing a la cart, a price for set up, a price for hooping, a price for this and a price for that. I don't appreciate that when I shop and don't expect that you would either. I truly love every aspect of embroidery and I want your shopping experience with Cajun Stitchery to not only be pleasant but pleasantly memorable. We want repeat customers. Cajun Stitchery’s first anniversary was wonderful. Congratulations to all of the contest winners. We had fun. Cajun Stitchery’s Facebook page has over 280 fans now. That is just amazing and wonderful. If you are not a Cajun Stitchery Facebook fan, please join us. This week we did another duffel bag. The photographs are on the blog and Facebook. It really turned out cute. Every time we do one of those, we get lots of comments on how adorable they are. Today we’ve been working on a tablecloth to go with napkins that we did earlier. Poo yie, that turned out pretty, yes. It’s a red tablecloth with white poinsettias on opposing corners and the name “Ballew” on the other opposing corners. The pictures will be posted. The poinsettia design was, of course, much smaller on the napkins. Here, again, we needed the same design but larger. We weren’t as lucky this time as we were with the little wrestler tyke. We blew the design up to 5” and although not too bad, it did lose too much detail for us to use on the tablecloth. We were able to put this design through the digitizing program and re-digitize the areas of the design which were askew. That worked fine. The garden is growing and looking prettier everyday. The asparagus is being harvested daily and we seem to be harvesting more and more of it each day. The seeds are now seedlings. We are still having a bumper crop of lettuce, carrots, onions, broccoli, and parsley. Everything is growing and looking beautiful. Earth Day is this month, so, I think that will be our theme for the month. Bet you thought that was our theme every month. This week I received an email from a friend in Alabama. She received a Cajun Stitchery gift certificate and wants to redeem it for handkerchiefs. She said that she is always leaving tissue in her pockets and the lint from the tissues gets all over her laundry. So, she would like to spearhead a movement to return to cloth handkerchiefs. Well, I couldn’t agree more. I needed to find a wholesaler for handkerchiefs. Those are hard to find. Most are companies in India or China, and while I’m sure they must be good companies, all of my wholesalers are in the USA. Long story short, I found one in the USA that has beautiful handkerchiefs. I ordered the minimum order and should be receiving the shipment Monday. I ordered several different styles but all are 100% cotton with lace someplace on them. The handkerchiefs will sell for $5.00 each, not including embroidery. These will make beautiful gifts, as well. When I received the email about the handkerchiefs, I immediately began making handkerchiefs with hand rolled hems. I put a couple on Etsy and a few have gone as lagniappes or presents. As you know, all of the handmade items from Cajun Stitchery are sold on Etsy. I’m thinking about making lots of these. They are easy and fun to make. By the time I went to our girls night on Wednesday with the Nereids, we all decided to switch to cloth handkerchiefs and we encourage everyone to do so, if not for your laundry, do it for your planet. Insofar as handkerchiefs are concerned, these delicate little things will not hold heavy embroidery designs. So, choose your designs carefully. Initials work fine. We are still playing around with the idea of the clamping system. As I told one of my friends, I sent the email asking for your input because, not only do I truly value your input, but I want the thing so bad that I don’t trust my judgment. Thank you, thank you, thank you, for all of the wonderful emails and wonderful input and ideas. I am awaiting a response from the company to an email that I sent. Depending on their response, will determine whether we go ahead and get the clamping system. As you can tell, this has been a busy week at Cajun Stitchery. I know I’m pooped. Hope next week is just as busy and exciting. Thibodeaux: Boudreaux, What's the score? When an injury, such as a broken bone, requires an ice pack, grab a bag of frozen peas. The peas can be broken up in the bag and this allows the bag to be molded to the area you are trying to chill. Works great for tired muscles, black eyes or severe bruising. You need to wrap the peas in a kitchen towel so that the plastic is not in direct contact with the skin. Also, I mark my pea bag with a big "X" so that I know not to use them for cooking. It is best to have two bags when aggressively treating an injury. P.S. You are always welcome to stop by and look at all of the new catalogs and pass some time with me, cher. Don't You Just Love Those Old Fashioned Ladies Handkerchiefs? A friend of mine emailed and said she wanted to order some ladies handkerchiefs. She said that her husband chidded her for leaving Kleenex in her pockets and when they did laundry those little bits of Kleenex lint were all over everything. She said that she wanted to bring back the dainty ladies handkerchiefs of old. I immediately set about making some handkerchiefs and hand rolled the hems. Then I regained my senses and went searching on the internet for wholesalers of ready made handkerchiefs. My handkerchief search reveals some things to me. Most handkerchief wholesalers are in China or India. Although those wholesalers probably offer a good product and are good companies, it dawned on me that all of my wholesalers are within the United States. In fact, most of my wholesalers are factories that actually make the thread or fabric. Those that are middle men may purchase from China or India. All I know is that I purchase from the United States. In the end, my new handkerchief wholesaler is here in the good ole USA. I wanted nice, dainty, elegant, high end ladies handkerchiefs. The funny thing is that I ended up with a company that I have visited their website ever since I was first introduced to machine embroidery. I never purchased anything there, just got great ideas from them. Now they have grown to have a wholesale company in addition to their retail company. I have now placed my first order and am anxiously awaiting arrival. It will probably arrive in a week. I purchased a few of many of the handkerchiefs available. Everything that I purchased is embroiderable. No. I did not purchase any Irish Linen. That Irish Linen company that impressed me never responded to my inquiries. My new wholesale company does carry the Irish Linen. I can get it if you want. I purchased a lot of their middle-of-the-road handkerchiefs. There really was nothing there that I did not like. Now I have to determine what we are going to charge for these little goodies. At this point, I believe we will charge $5 or $6 for each, plus embroidery. The internet search gave me so many wonderful ideas. These handkerchiefs are definitely in the "heirloom" area and would make nice gifts for any shower, wedding, birthday, etc. I saw some of these handkerchiefs that had things like wedding bells embroidered with the names of the couple and date of marriage and some with a baby's name and date of birth. One place suggested the handkerchiefs as wedding favors and had the handkerchief folded on a tiny coat hanger with a cardboard bodice. All of the handkerchiefs that I purchased are white, except I did purchase 5 black handkerchiefs. The synopsis under the black handkerchief said that these were appropriate at funerals or as a gift to the surviving spouse. Some of these handkerchiefs are even used in scrapbooking. They are all 100% cotton. The ones that I purchased all have lace, as well. As I said, when my friend first contacted me, I immediately made a couple of handkerchiefs. Those handkerchiefs are now on our Etsy website for sale. I may be making more. In fact, I think the ones that I made will be more in the everyday handkerchief category or "artsy" category. Those are a good thing for me to do with my hands when I'm just sitting around. All of that is to say that I, personally, am tossing out my kleenex and bringing on the cloth handkerchiefs and hope all of you do the same. Now onto the next unusual request. A customer asked if we embroidered welcome mats. I never thought of that and initially wondered if Boudreaux could do that. Then came the internet search. As usual, I was very surprised to see that carpet, mats, rugs can be embroidered. This venture may require us purchasing a special hoop for Boudreaux. The customer has a condominium in Navarre that they rent and they wanted a welcome mat with the name of the condominium and a design of a pelican. Immediately, I'm thinking that I want one that says Cajun Stitchery:>) So far, I have not found a wholesale company for the door mat/welcome mat. Still looking for that. In the meantime, we are going to go buy one someplace and see how it works on Boudreaux. Oh, and yes, Boudreaux is supposed to be able to embroider on these mats. Hopefully, I'll finish another duffel bag today. Don't you love the little "wrestler tyke" design. It's Monday. Hope everyone had a nice Easter weekend. Saturday our son in Tampa called us and was chit chatting when I looked at the front door and there he was. What a little stinker he is! That was a pleasant and special surprise. He and his family drove from Tampa to Pensacola on Saturday morning; then back to Tampa on Sunday morning. Ahhh! To be young, again. I could no more do that anymore than the man in the moon. It sure made our Easter special. The last contest winner wanted frogs on her napkins. She picked 4 frog designs and finally decided on one. She selected purple napkins. I think they turned out lovely. I made the little dog harness and took it to my neighbor. It fit his smallest dog -- 4.5 lbs. They tell me that she wore the harness all day on Sunday and it worked great. Now I'm just waiting for them to wash and dry it. If that turns out well, I'm making them and selling them on Etsy. They are so cute. Our neighbor returned from her two week vacation and had Easter dinner with us. We harvested lettuce, carrots, broccoli, and asparagus and combined with ham and boiled eggs we had a really nice chef's salad. You don't get any healthier than that. Afterwards, we just enjoyed the beautiful weather, sitting in her back yard with more neighbors, wine and conversation. Peace on Earth. A customer asked a very interesting question: Do you embroider welcome mats? I have never thought about it. I did some research on the internet and there are some really nice welcome mats, car mats, boat mats, and so forth, that are embroidered. Boudreaux is supposed to be able to embroider these mats; although, I may have to purchase a special hoop. Anyway, we are looking into it. I need to find a good wholesaler who deals in blank welcome mats. Back to the embroidery machine.